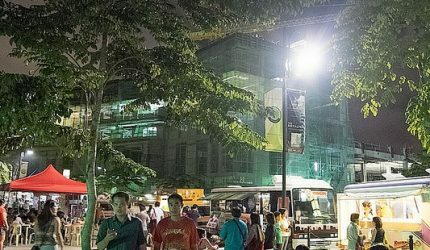 Street side eats add a welcome change as food trucks roll in at Capitol Commons in Pasig. Just within the neighborhood, I checked out this rising commercial area that’s set to redefine the lifestyle of Pasig residents. I’m surprised to see a well-manicured garden, stylistic lamp postss, oh so inviting benches, wide spaces and nice breeze amidst constructions. The ambiance is already there, so what’s missing? How about some great eats? So here comes the Food Truck Parks‘ offerings delivering an all new dining experience at Capitol Commons.